Exercises for more balance in the bustle of everyday life, that is what Do-In, Tao yoga for health and energy offers, in a very accessible way. Do-In is a thousand years old form of movement, originally developed under the influence of Taoism and oriental medicine. According to this philosophy, the world is a unity where everything is composed of energy (known as ki, or qi), including human beings. This energy is always in motion. Do-In could be seen as the yoga of oriental medicine, and is an effective form to cultivate your inner strength and peace in this hectic society of everyday life. 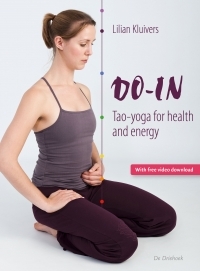 Do-In, Tao yoga for health and energy is an introduction to the principles of oriental medicine. Lilian Kluivers explains the functioning of the meridians and the Five Elements in combination with Do-In exercises. This combination of insight and practical programs for self-practice with stretching, self massage and self acupressure are suitable for everyone. Do-In contributes to greater energy and health, regardless of experience or flexibility. Supported by the wisdom of oriental medicine Lilian Kluivers teaches Do-In and gives shiatsu treatments. She founded Do-In Academy, where she teaches educations and specializations. In addition she writes articles about Do-In and related subjects for several magazines. Her goal is to share the oriental wisdom about the body in an accessible way by passing through Do-In exercises and techniques for self-treatment. Including two complete Do-In classes!